Building a business with the end in mind is the topic of today’s discussion. It’s very disheartening, as a business owner, to get to the end of your business to only find out that you don’t have enough value in your business to exit. 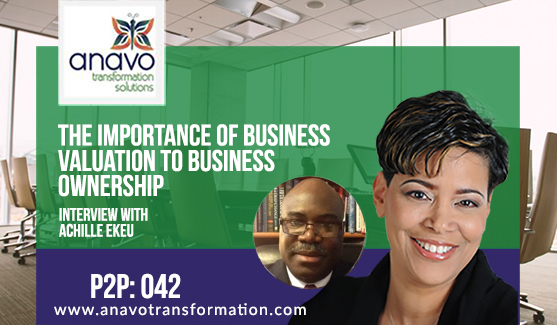 My guest, Achille Ekeu, President, and CEO of the Washington Evaluation Group, will help us understand the importance of having and knowing your business’ value as you build and grow your business. Why are business valuations important in terms of growing your business? When should a company consider getting a business valuation? What exactly is a business valuation and what’s the process of getting one conducted? What sort of things add to a business’ value? What documents should business owners collect, compile, and maintain on a regular basis? How Achille helps business owners measure their goals. Why a business owner should track their progress in their business. The difference between pricing and valuing. How often a company should have a business valuation. How long it takes to get a business valuation.